On Monday I woke up anticipating a nice, quiet week having already finished this weeks song… my only tasks being to edit a video, write a blog and do a few other bits and bobs behind the scenes. 1) I’m really, really lazy. 2) The phone rang on Monday and suddenly I had lots of jobs to do. The jobs were exciting but they were also bloody hard work (mentally). One of them was to make a final tracklisting for the onesongaweek best of – which has seen me go round in circles for the last 100 or so hours. Imagine having 52 children and being asked to single out 15 favourites?! I guess week 47 began all the way back in 2009. November, I think? I played one of the weirdest shows of my life – in a posh hotel in London as part of the evening entertainment for a music industry conference called Live UK. Also playing on that day was a chap called Ed Sheeran. There was an expensive coffee machine in the backstage/conference room. We listened to Gideon Conn‘s album and I burnt a copy (sorry Gideon)! We went out for a cigarette and Ed told me that his manager (at the time) had given him a copy of my EP (You, Your Cat & Me) and told him to ‘write more choruses like Frank Hamilton’. Turns out Ed wasn’t up for that and got rid of his manager soon after, sticking to his musical guns and making plans to forge himself a career (probably not a bad shout)! Fast forward to the summer of 2012 and I’m glued to the chair in my studio persuing a silly idea I had on January 2nd while Ed is touring the world, selling millions of records and securing himself a tidy pension. Then this appeared in Total Guitar Magazine (I only found out because someone tweeted me). Firstly, lastly and everything inbetween(ly)… what a bloody nice thing to do. 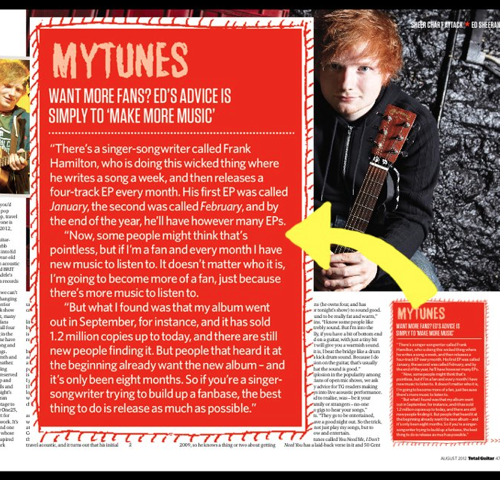 Our story now darts back to 2011, during which another manager (part man, part snake) got in touch to tell me that because Ed Sheeran was doing so well the climate was finally right for me to go and get a massive record deal. He sent me 5 songs Ed had written with a guy called Si Hulbert and told me I should record one/some of them (to use as Frank Hamilton songs). I wasn’t sure but said I’d have a go at ‘I Miss You’ aslong as I could re-write the end of the chorus? They said I wasn’t allowed and that was that. I’d been Facebook friends with (known but not really known) Si for a while when I chanced a call to ask if he remembered the song and knew whether or not it was ever finished. He did and it wasn’t… and the rest, as they say, is just nonsense on Wikipedia. Going round in circles trying to write a great new pre & chorus.. Putting copius amounts of pressure on myself to ‘get it right’. Turning it into an upbeat/skiffle track before losing the plot. FINALLY getting it right at 5am… and recording it there and then. 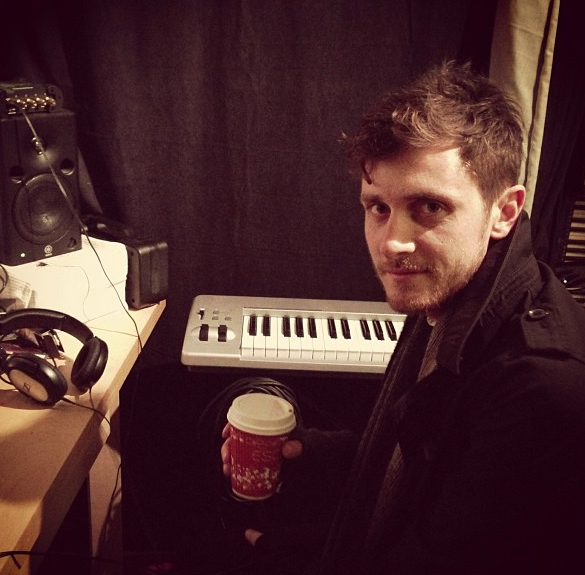 Here’s a picture of me the next day, with tired eyes and coffee. The weirdest thing about all of this is that I don’t really know what Ed thinks of the song now it’s finished! The fact that you’re listening to it means he must have said yes to it but I’ve only managed to catch up with him once (briefly) before his show in Hammersmith last month… and the chorus wasn’t even written then! So there we have it – the story of week 47. One for the grandkids. …today I’m releasing a song co-written with the biggest artist in the world. The same artist who played 312 gigs in one year, worked his balls off to make his dreams come true and helped give people like me (who weren’t doing our upmost) the kick up the arse we needed to see that if you put your mind, body and soul in to something… anything’s possible. With that in mind, onward to week 48! (after the video, of course, which replaces the ‘favourite lyric’ section for one week only)! Shot in my living room on Sunday in the space of about an hour and edited by yours truly (in true DIY/onesongaweek fashion). Thanks to Gio, Naomi, Barbara and Andy for all their help.